Music Express Ride is a large disc, can roll, turn, can do a variety of sports. Visitors on the big disc on the sofa sitting around for a week, accompanied by rich music, the body with the disc movement, action chic, eyes closed play, rich disco effect. 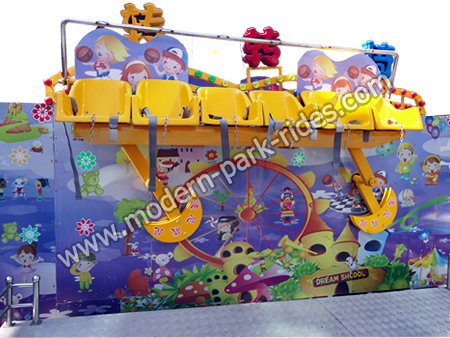 Music Express Ride is a gyroscope high speed swivel large amusement equipment. Tourists ride the cockpit under the action of strong centrifugal force, high-speed rotation of the fly, as if pushed into the sky beyond the sky, over the sea, such as the sea waves bumps, such as space flying saucer, dizzy, changing infinity; thrilling excitement, Voice synchronization, it is memorable; passengers tightly in the cockpit, the body no longer belong to their own, all to the trust of the universe can play equipment, as long as you firmly grasp the opportunity for this success, you can achieve the inner self. So that the wind whirring along with your joy every time you finish, the victory is often a brave. Music Express Ride has become one of the necessary equipment for each domestic entertainment. New Park Rides Music Express Ride belongs to track amusement equipment. In the orbital design innovation, there is the feeling of riding a roller coaster, very exciting, visitors take the hanging box in the strong centrifugal force, the ups and downs are memorable. Feel the body is no longer their own, as long as you firmly grasp the opportunity, you can achieve the inner self. So that the wind whirring along with your joy every time you finish, the victory is often a brave. It is so fun. This equipment is my company another big innovation, welcome customers to consult business negotiations, let us join hands in creating the peak of the entertainment industry, hand in hand starters, create brilliant. 1. Mini tagada ride is equipped with gorgeous light and exciting music, which makes the rides with more attraction. 2. Mini tagada rides are made of fiberglass reinforce plastic and steel, which is durable and firm. 3. The material is environmental, resistant to corrosion and stable. 4. Mini tagada rides bring the thrilling experience to riders that they will never forget. 5. Modern manufactured with the mini tagada ride with many years experience and can guarantee all riders’ safety. This tagada ride is designed with more LED lights and beautiful music and the main riders are kids and adults in the purpose of children’s safety and exciting feelings. When you are looking for the rides, please contact us freely. Ma amusement equipment is vertical shaft swivel traditional recreation projects, contrast and bold and unrestrained pony, such as joy in the grasslands such as soar, kangaroo rides ,in the blue sky, give a person with endless reverie, unlimited joy. The pirate ship with the fluctuation of the sea, like fish swimming in the water, thrilling and very entertaining, put aside the city noise, the taste of coffee to bring you elegant, indoor amusement parks ,ocean of love witness our love. Double flying surprise and excitement presence, diving Longmen joy and happiness co-exist,amphibian tank to be happy, dolphins swimming filled with joy, mini disco ,fighting Shark Island very stimulating, disco turntable dreams of 2000, mini disc only for your happiness, kangaroom jump, with your joy bouncing a childhood dream; double flying to bring you thrilling stimulation, amphibian tank to do it a real man, we can custom Oh; bear infested novelstyle, loved by children, controlled aircraft flying in the air, Mini Pirate Ship ,enjoying the happy. With your imagination, a pulley, experience the excitement and joy! The British Council will show you will be the world's smallest nightclub - "mini discotheque". This will also be the mini disco for the first time in China. The British Council is pleased with the Beijing Association for friendship with foreign countries, together with the "mini disco" ( mini roller coasters )energetic performance to show the unique style of British nightclub life. "Mini disco" the performance will be held in Wangfujing Street Mall, the new Dongan Beijing Normal University and Shichahai lotus market.